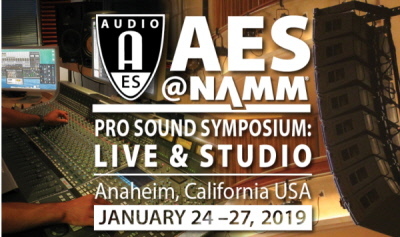 2019년 1월24일부터 27일까지 AES가 주관하는 AES NAMM 2019 Program 회의가 개최된다. 미국 로스앤젤레스 Anaheim Hilton Hotel 에서 개최된다. Audio over IP는 무대와 스튜디오에서 빠르게 오디오 배포 방식으로 선택되고 있습니다. QSC의 Bob Lee가 주최하는 디지털 오디오 네트워킹 아카데미 세션에서는 기본적인 디지털 네트워킹 기술, 프로토콜 및 응용 프로그램에 대해 다룹니다. 선도적인 라인 어레이 제조업체는 Line Array Loudspeaker System Academy 참석자들에게 최신 콤팩트 라인 어레이 오퍼링의 세부 사항을 소개하고 지시 할 것입니다. 90분 강의 세션은 라인 어레이의 디자인, 이론 및 지원 소프트웨어 구성 요소를 소규모 클래스 형식으로 가르칩니다. 두 번째 90분간의 실질적인 실제 세션에서는 휴대용 라인 어레이 타워에서 어레이를 세우는데 필요한 기계적 조립 및 전기 연결 세부 사항을 설명하여 핑크 노이즈 및 음악 평가 트랙을 사용하여 시스템 증명 및 범위 확인을 완성합니다. Leading line array manufacturers will each introduce and instruct Line Array Loudspeaker System Academy attendees on the operational details of their latest compact line-array offering. A 90-minute classroom session teaches the line array's design, theory and supporting software components in a small class format. A second 90-minute hands-on practical session instructs mechanical assembly and electrical hook-up details for erecting an array from a portable line array tower, culminating in system proof and coverage confirmation with the use of pink noise and an evaluation track of music. 주요 제조업체의 인기 있는 라이브 디지털 콘솔은 강사가 라이브 믹서 콘솔 아카데미 참석자(라이브 디지털 믹서의 작동 세부 정보는 물론 최신 소프트웨어 버전 기능 포함)에 대해 소개하고 가르칩니다. 무선 전문 투어 Ike Zimbel이 주최하는 Entertainment Wireless Academy는 중요한 스펙트럼 업데이트 패널에서 무선 주파수 스펙트럼의 향후 변경 사항을 논의하고 Sennheiser, Lectrosonics 등의 최신 브랜드의 무선 하드웨어 혁신에 대한 90 분간의 교실 수업을 매일 같이 시작합니다. Alteros / Audio-Technica 및 Professional Wireless Systems / RAD를 지원합니다. 이 세션에는 무선 스펙트럼의 향후 변화에 대한 참석자를 준비하는 모범 사례, 안테나 시스템 및 주파수 조정이 포함됩니다. 일요일의 프로그램에는 경력 패널이 포함되어 있습니다. Hosted by wireless touring professional Ike Zimbel, Entertainment Wireless Academy begins each day with an important Spectrum Update panel discussing upcoming changes to wireless-frequency spectrum, followed by 90-minute breakout classroom instruction on recent wireless hardware innovations from leading brands, including Sennheiser, Lectrosonics, Alteros/Audio-Technica and Professional Wireless Systems/RAD. 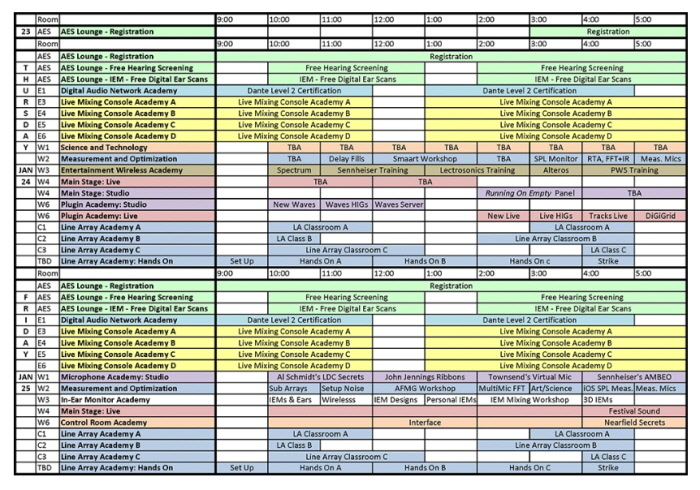 These sessions include best practices, antenna systems and frequency coordination to prepare attendees for the coming changes in wireless spectrum. Sunday’s program includes a Career panel. Hosted by in-ear monitor touring professional Mark Frink, the In-Ear Monitor Academy starts with an important IEM Fundamentals presentation discussing IEM best practices and examining the physiology of hearing and fundamentals of in-ear monitor engineering that can help with hearing conservation. This is followed by a session on engineering wireless IEMs and upcoming changes to wireless frequency spectrum. The afternoon will be dedicated to a demonstration of in-ear monitor engineering practices with support from leading IEM brands, including Ultimate Ears, KLANG, Lectrosonics and Sennheiser. 컨트롤 룸 아카데미 세션에서 스튜디오 모니터, 인터페이스, 최적화, 플러그인 등 주요 레코딩 제작 요소 및 제품에 대해 자세히 알아보십시오. 목요일의 프로그램은 Waves에 초점을 맞출 예정이다. 스튜디오 애플리케이션은 오후에, 라이브 사운드는 오후에 라이브 스테이지 및 스튜디오 프레젠테이션에서 메인 스테이지와 유사한 분할을 한다. 일요일에는 오디오 고등 교육에 대한 DIY 워크숍, 취업 패널 및 통찰력이 포함됩니다. 금요일과 토요일은 주요 관제실 당국에서 심도 깊고 2 시간 동안 진행됩니다. Learn more about key recording production factors and products, including Studio Monitors, Interfaces, Optimization, Plug-ins and more in the Control Room Academy sessions. Thursday’s program will be focused on Waves, with Studio applications in the morning and Live Sound in the afternoon, reflecting a similar split on Thursday in the Main Stage: Live and Studio presentations. Sunday includes a DIY Workshop, Career panel and insights into audio Higher Education. Friday and Saturday feature in-depth, two-hour sessions from leading control room authorities. 제작자, 엔지니어, 음악가 및 작곡가와 관련된 다양한 주제와 쟁점을 다루기 때문에 음반 업계의 가장 큰 이름에서 배우십시오. 프로듀서/엔지니어/저자인 Bobby Owsinski가 주최 한 프레젠테이션은 Andrew Scheps, Sylvia Massy, ​​Gavin Lurssen, Reuben Cohen, Ron McMaster 등과 같은 업계 전문가로부터 4 일간 진행됩니다. Outside-the-Box 레코딩 기술에서부터 Run On Empty를 다시 마스터하기까지 모든 내용이 포함됩니다.